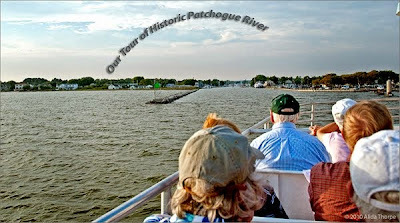 The Bayport Heritage Association enjoyed the tour of historic Patchogue River, on August 17th 2010. 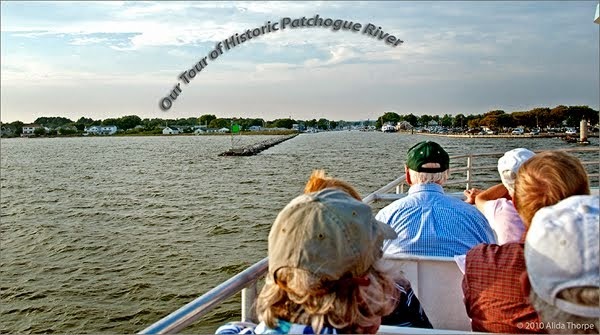 The weather was perfect for the evening cruise by ferry, along the shores of Bayport and Blue Point and then up the Patchogue River. Patchogue historian Pete Berman narrated the river’s history, and Gene Horton and Jim Connell filled in with the local history of Bayport and Blue Point. The evening was completed with a delicious dinner at Watch Hill on Fire Island. Then we enjoyed the ferry ride back across the Great South Bay to Sayville. The weather could not have been better! It was an enjoyable evening! Thanks to everyone who helped with the planning and presentation!